Do Good, Feel Good. No matter your age, everyone wants to feel like they are a contributing member of society. This is what drives us to volunteer for charities that we are passionate about and support local causes that make our communities better places to live. This impulse to leave your mark and make the world a better place does not end with old age. Studies have clearly shown that there are definite health benefits for senior volunteers. These benefits include higher levels of a sense of wellbeing and reduction of stress. Volunteering helps to keep older adults engaged and their minds active which can positively contribute to a person’s cognitive health. 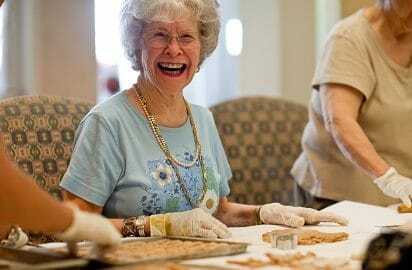 The National Institution of Aging reported that seniors with a sense of purpose who contribute in meaningful ways can lower their risk of dementia and other health problems. Volunteering can promote physical activity and cardio health as they sort cans of food at a food bank, canvas the local neighborhood, or participate in organizing a charity event. Regular exercise can help to fend off illness and disease. And if they engage in an activity that they are passionate about or it is something they enjoy, then it won’t feel like exercise. Another great benefit for seniors who volunteer is an opportunity to socialize with other seniors while doing something proactively that they care about. Through a shared sense of purpose, seniors can make new friendships and create special bonds with their neighbors. Feeling that you are accountable to others and contributing to something bigger than yourself can boost one’s sense of worth. And higher self-esteem can benefit a person’s overall well-being and positive outlook. Think of ways that your parent can use their unique skills and personality or for your family to give back as a team. Check with your local senior center, church, or local charities to see if there is a program to volunteer or contribute. Mentor an at-risk child or teen with personal or professional guidance and coaching. If your parent loves animals, they can walk dogs at an animal shelter, foster an ill pet, groom furry friends, or volunteer during an adoption drive. If your parent is a veteran or a veteran’s spouse, there are local opportunities tovolunteer at USO—from greeting troops returning home, to making coffee and meals, to providing warm blankets for those troops during long layovers. Volunteer at a local USO center. Create and send cards to members of the military or decorate the local veterans’ hospital during holidays. If your parent is creative, knit or crochet lap blankets for homeless shelters or the American Red Cross; or create non-skid slippers for elderly patients in the hospital or at a nursing home. For the home chef, prepare and package food for Meals on Wheels; or bake cookies and treats for first responders in the community. For the educator, practice reading skills with school-age children, start a pen pal program with a local school, or volunteer at the library or neighborhood historical society. To support their peers, read personal letters or books to those who are visually impaired or volunteer as a companion. If your parent is skilled in the garden, plant flowers in a local park, beautify their local neighborhood, or create a backyard habitat for local wildlife and construct protective birdhouses for the cold winter months. For seniors who can still drive, deliver groceries to homebound neighbors or drive them to doctor’s appointments. If they are politically-minded, volunteer to support a candidate or help at a polling station. Aegis Living has created programs to support local charities and continue volunteer efforts among our elderly residents. We create opportunities for our residents to feel connected, useful, and a part of the greater community where they live. These programs are unique for each community to participate in local causes that interest the residents in that community. There is no age limit to volunteering and charity work. As your parent reaches their golden years, they can adapt how they contribute. For example, at Aegis of Aptos, our knitting group makes hats for Jacob’s Heart Children’s Cancer Support Services. Each colorful cap is knitted and gifted to a child with cancer who have lost their hair during chemotherapy. A loving service such as this is not only beneficial to the child in need but also gratifying for the senior with a sense of purpose. Using their knitting skills to give back provides our residents with a greater sense of accomplishment and personal satisfaction. It’s never too late to get started as a volunteer and find a cause or charity that you are passionate about. Having a sense of purpose is as important for seniors today, as when they were much younger. No matter how small, volunteering can spread love and cheer to those who receive it and benefit the senior who gives of their time and talent.